Where your art is concerned; do you ever ask yourself "How do I make a better painting...?" with myself when I paint ,I continuously look to successfully create a work of art that communicates. In order to do this I believe in "talking art". works or does not in your art. O.K don't run away because I said the "critique" word. experience to be afraid of. A critique is nothing more than a dialog used to share ideas about creative design specifics. art we are looking at as a group. whole to make a successful painting. how and what to look for when studying your art. to help artist's get started in understanding how to look at and critique our art. a) Does the painting express your feelings on the subject? b) Is there a center of interest to the composition. Is it well placed? c) Is there a dominance of color or of mood in your art? d) Are there interesting color combinations within the work? e) Is there a large, dominant shape supported by middle and small pattern areas that repeat the dominant shape and form in the painting? balance the busy patterned areas of your artwork? Now I want you to pull out one of your recent paintings and "let's talk art". am able to learn from in a good critique. "MAKING MUSIC" 26 x 34 poured water colors and acrylics on paper. In creating this work, my goal was to capture the essence of the magic that occurs for a musician playing the guitar. I chose to use a fusion of warm hues to create a mood, abstraction combined with representation to communicate the musician's passion. Was I successful? Let's look at this painting relative to my "talk art" list. Starting with answering my question have I successfully expressed myself? 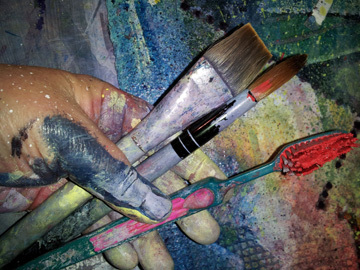 In every painting we create there are going to be brush strokes or colors and regions that we fall in love with. Like wise there will be elements that need work. I believe that this painting definitely expresses my passions about music and musicians. I have created a mood by using warm colors. And I use a lot of patterns to emulate the musical energy of sound. composition problems. What do you see? I have a dominance of color or of mood? I have interesting color combinations within the work? I have a large, dominant shape ( musician) supported by middle and small sized areas ( guitars) that repeat the dark value of the dominant shape and form? But I see a discord that for me just does not create the visual design balance that I am looking for! Unfortunately I am unable to "SEE" the problem. Oh my what should I do? Look to other artists for ideas! I frequent a art web site page on FaceBook originally started by Nicholas Simmons. This FB page is dedicated to helping artists, like you and I, to share our art with others and receive comments that may help us to see and understand our work through the eyes of different artists around the globe. Last week my painting was critiqued by master water media artist Mike Bailey. This was a priceless adventure is learning! It always helps in a "talk art" session to have a list of questions that you as the artist would like to see others respond to. Mike generously shared several ideas about my painting, but for today I am only going to touch on one design aspect that bothers me the most about my new painting. Click here if you want to read all of Mikes comments. "does my use of values in framing the musician with a darker more intense hue correctly balance the composition and successfully direct the viewer's eye to the center of interest? The question is, does this idea work relative to the whole painting? In Mike's "art talk" he shared with me specific design points that got me thinking..... He said. 1) " I believe you should pay close attention . . . .. to the contrast of direction that is so harshly stated with the crossing of the two guitar necks. That calls striking attention to the hand on the neck and defeats the viewer from looking at the concentration on the face of the musician. While there is contrast of direction, there is also dark light contrast at the same locale." 2) "You might want to consider eliminating that feature from the composition entirely. If balance was your concern and you used the dark guitar to add balance, I can assure you that all of that motion in that region from your textural abstractions settles the balance issue very nicely without the upright guitar neck." Mike's answer added to my understanding of composition. Now, back to my original question did my original idea work relative to the whole painting? NO my choice of a vertical counterpoint to the neck of the guitar was not working. Now what do I do? My goal is to learn from the critique comments, but at the same time be true to my vision. I have two options. without damaging the original art. Let me share with you how I used digital technology to help me with my learning curve to improve this work and help me in the design of my future paintings. I have a program, on my computer by Adobe called PhotoShop. I regularly use this program to help me create my designs. Today I want to take my critique information and utilize the knowledge as a stepping stone to creating a better design composition. I start by opening a JPEG image of my finished painting and then with the program's paintbrushes and other tools I recreated the painting "Making Music" . But this time I digitally "paint" with Mike Bailey's critique's suggestions in mind. In otherword I used technology to repaint my painting. And with a resounding nod to failure...I moved on to another idea! 2) I glazed over the musician's hands to make them less detailed & more abstract. 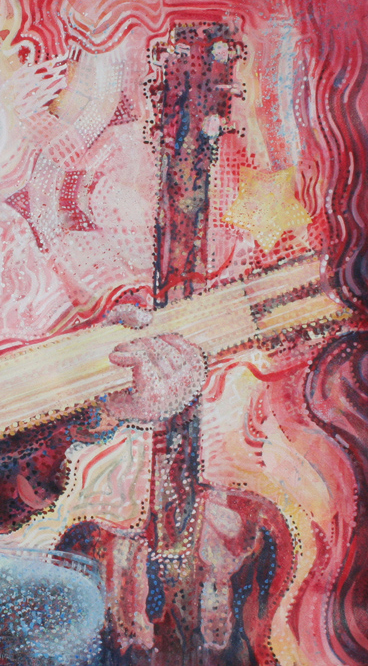 3) I removed the guitar and I copied the abstract patterns over the area where the vertical instrument was. By Jove I believe we have a successful idea here! I enjoy working in this digital format because it helps me to visualize the possibilities of an improved composition without having to worry about ruining my art on paper by over experimenting. So you are probably wondering...now,that I have learned and seen a new way of approaching the composition of my art; am I going to drag this painting back to the studio to actually repaint this work? No I am going to leave this work alone. 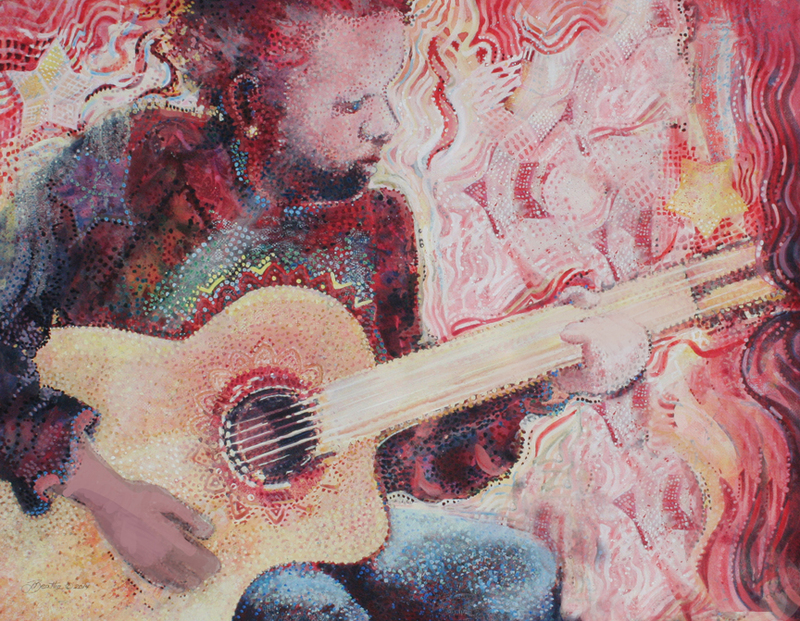 Take a subject that I enjoy working with and create a series of paintings all based upon the same "musician" subject. This idea should keep me busy in the studio for the next couple of decades! Working in a series all of similar subject matter is fun. Some of art history's finest painters have worked in series. So it seems logical to me to follow in the footsteps of for example Claude Monet. Monet was known to paint the same objects and or locations repeatedly, yet with each painting the artist created something new and exciting. Look at Claude Monet's haystack paintings for wondrous examples of working in a series! O.K I digress from this blogs " talk art" discussion. In my next article I will share with you how one idea can blossom into a series, no a garden of inspiration. I hope you have enjoyed this blog post about the benefits of art critiques. 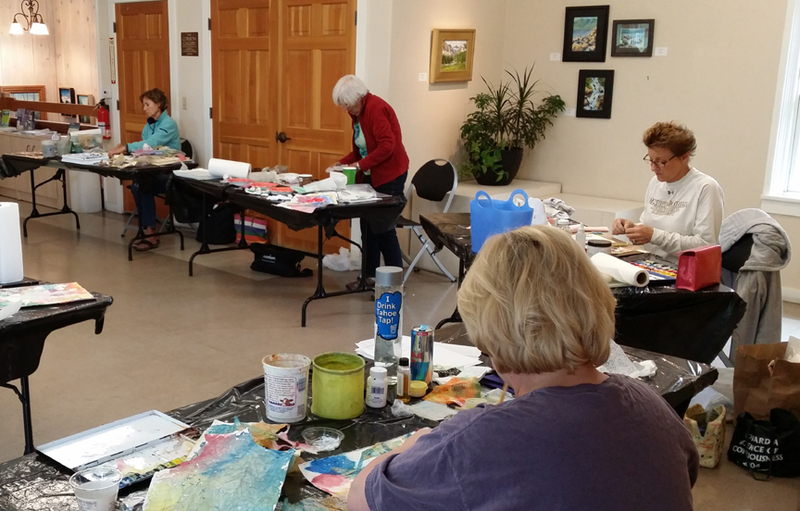 For me taking part in an "Art Talk" is the best way to gather an improved understanding about painting. Ultimately, what I know is important is that a painting must work together as a whole. No one part of the design should rule a composition without also working well with its neighbor design elements. Sometimes one has to be willing to look carefully through another artist's vision and even consider painting several options in order to acquire a true understanding of the principals of design. Until next time...Carpe Paintum ( seize the paint & brushes) my friends and keep practicing.